New Bajaj Pulsar RS200 Specifications - Bajaj Pulsar RS200 equipped with engine capacity of 199.5cc, Fuel Injection, single cylinder, 4 stroke, SOHC 4valve, Liquid cooled, triple spark. The machine is capable of spewing out power reaches a maximum of 24.5 PS at 9750 rpm and maximum torque of 18.6 Nm at 8000 rpm. Motor sport is capable of driving up to speeds of 140 km / h.
New Bajaj Pulsar RS200 has dimensions of length 1999 mm, width 765 mm and height 1114 mm with a wheelbase of 1355 mm and the lowest distance to the ground 157 mm. Motor sport with a weight of 165 kg is equipped with a gas tank with a capacity of 13 liters. Crystal LED Tail Lights - Distinctive high intensity tail lamps: Dazzle the competition as you whizz past them. Perimeter frame - High stiffnes-low flex for sharpest handling: Conquer the trickiest hairpins with elan. Liquid Cooling - Optimum engine performance at high temperatures: Ride On, No matter what. 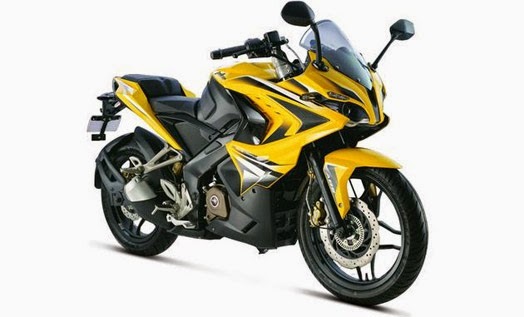 As for price Bajaj Pulsar RS200 non-ABS priced at Rs 118,000, while for the type of ABS priced at Rs 114,000.